In case anyone hasn't heard yet, Phil Miller of the Pioneer Press was laid-off today. He was one of the better better sport writers in the Twin Cities and helped make the Press readable again. It's really a sad day for the world of journalism. But unfortunately, the news of layoffs shouldn't come as a surprise and as sad as it is to say, this won't be the last. Good luck to Phil. He's an outstanding individual and a superb writer. The Minnesota Twins have had a lot of concerns early this season. Some are injuries, but the most are players just not getting the job done. The bullpen has slowly but surely turned a horrible start into a solid season up to this point, the rotation has followed suit as well. Unfortunately, the middle infield problems that was a question mark prior to the season is now leaving everyone completely up in arms. Alexi Casilla had an outstanding first half to the 2008 season but he leveled off and got injured in the second-half and never looked the same afterward. He was given a huge vote of confidence in the off-season when manager Ron Gardenhire laughed off any media outlet who questioned if Casilla would start the season at second base or if he was in danger of losing his spot. Casilla looked to be back on track in Spring Training when he hit .306/.354/.361 while playing steady defense at second base. But all of that unraveled once the season started. To replace Casilla, the Twins have used a rotation of Nick Punto, Matt Tolbert and Brendan Harris. Harris has played second base, shortstop and third base, but the Twins believe that second base is his weakest position and if we’re looking at the small sample size, they’re right. According to UZR/150, Harris has played much better defense both at shortstop and third base this season compared to second base. Harris is labeled as a “natural shortstop” and Gardenhire just doesn’t believe he fits right at second base, which is evident with his poor footwork when turning a double play. He also features a very strong arm, which is better suited for shortstop. Punto and Tolbert are about the same player offensively, although Punto’s defense is far and away superior to Tolbert’s. But both player’s combined are hitting .204 with eight extra-base hits in 269 at-bats. Tolbert is one of Gardenhire’s favorite players due to his ability to run out a ball and play “on his toes.” Unfortunately, Tolbert has played in 40 of 78 games and continues to get starts on a semi-regular basis. It’s been time for his demotion to Rochester for a couple months now and while he and Punto continue to look absolutely worthless offensively, a player in the Minor Leagues looks to be primed to make his Major League debut. Steven Tolleson has looked outstanding in Rochester, although his defense too has been shaky at times, but more on that in a minute. Tolleson was promoted to Rochester in late May, but has carried an .828 OPS with him through his first 31 games and has maintained steady plate discipline. The former South Carolina Gamecock has just about gone from rags to riches in the last year-and-a-half. A once unknown prospect is now becoming one of the most talked-about prospects in the Twins system, although most of that is due to his counterparts at the Major League level playing so poorly. But nonetheless, he’s on just about everyone’s radar right now. Tolleson’s defense has never been stellar, but his natural position is believed to be second base. He has found himself playing second, shortstop, third base and left and center field as well. For that reason, I’m not surprised by his 12 errors this season. Although 12 is a little excessive, I’m confident that Tolleson will be able to handle the position better defensively than Tolbert or Casilla. His track record at second base suggests that he could be league average at the position, which is better than what either Tolbert or Casilla can say. Tolleson’s time in Rochester look more and more numbered every time Tolbert comes to bat. With the trade deadline coming up, and the Twins sitting just four games behind the Tigers, the Twins will need to upgrade second base somehow and what better way to do it from within? The Twins came in the game at 39-38, and it seems as though nobody can remember the last time they were two games over .500. As La Velle E. Neal III said, this was a big game and furthermore a big series for the Twins who are wrapping up a - what will hopefully be - successful road trip. Coming into the game, Twins starter Nick Blackburn had thrown at least seven innings in 10 of his 15 starts. And even more impressively, he was going for his third-straight complete game. But unfortunately, things didn't go necessarily as planned and Blackburn struggled through six innings while giving up ten hits and three runs although only two were earned. Despite throwing 65% of his 103 pitches over the plate for strikes, he struggled with his command and was all over the zone, leaving pitches up and making himself even more hittable than he already is. Thankfully, the Royals' putrid offense only took limited advantage against him because if Blackburn was facing an even league-average lineup (such as the division leading Detroit Tigers), they probably would have done a lot more damage. Regardless if Blackburn threw great, the offense was of no help. Royals starter Luke Hochevar walked the lead-off man Denard Span in the first inning and struggled with walks throughout the start. Unfortunately, like in the first inning with Span - where Brendan Harris failed to bunt him over, instead bunting the ball back to Hochevar making it an easy play to throw out Span at second - the Twins never capitalized on Hochevar's mistakes and only got two hits off of the 2006 first overall draft pick. Hochevar blanked the Twins through seven innings, giving up only two hits and four walks while striking out two. The Twins' offense finally got going a bit in the eighth inning. Span reached on a bunt single (which should please Aaron Gleeman) with Harris following him up with a single of his own. With good 'ole reliable Joe Mauer coming up to bat, Twins fans started getting on their feet, despite being down by four runs. Mauer then shocked everyone by beating the first ball he sees into the ground, grounding into his sixth double play of the season and his third in the last eight games. He finished the game 0-4. With Span advancing to third base, my first thought was that the Royals would walk Justin Morneau and take their chances with Jason Kubel. Kubel was involved earlier in the game with a bad call by the home plate umpire which lead to manager Ron Gardenhire's third ejection of the season. The umpire called Kubel out after not running to first base when he believed a ball hit off of the plate (or in the dirt, whichever). Kubel, Gardenhire and all of us watching the replays saw the ball hit off of his foot, which should have lead to a foul ball. Gardenhire and Kubel's protest were to no avail and while Gardenhire was thrown out of the game, Kubel was out on a ground ball to first base. Fearing Kubel's revenge, Morneau made the Royals pay for not walking him by working the count and eventually pulling a 71 mph slider into the Royals bullpen for his 18th home run of the season. But that was all the offense the Twins could get before Royals closer Joakim Soria closed the door on the Twins for good to pick up his 10th save of the season. Tonight, the Twins will try to even-out the series with Scott Baker (5-6, 5.17) facing fellow right-hander Brian Bannister (5-5, 4.17). Hopefully the Twins can stay on the north side of .500 ball. Short-season leagues start today, which will result in many teams adjusting rosters from the top to the bottom in order to fill out rosters throughout the system. The Twins generally wait until this time every year to make a lot of moves, giving the organization a little extra time to evaluate some of their players. By waiting an extra 2-2 1/2 months to promote some player, the Twins hope to find out which players previous season's were just mere illusions and which were naked truth's. Once upon a time, the Twins moved players fairly aggressively throughout the Minor League ranks. Aggressively is somewhat of a relative term in this instance, as the Twins weren't "aggressive" by some peoples standards but certainly more aggressive than their current approach. Back a few years ago, the age and experience were just about the only criteria into evaluating where a player would play. The Twins now a days want to see players experience just about everything possible at each level, which on the surface seems to be more logical. They want to witness a player deal with the ups and downs such as playing great and playing poorly, before moving them up. In another sense, they want to see them "come back to earth" either after a slump or after a stretch of playing great. Obviously that is just my opinion, but at least that is how I view one aspect of their approach in calling up a player. And although each case may be different, it certainly seemed to be the case for Twins third base prospect Danny Valencia. Valencia was promoted to New Britain almost exactly a year ago, and at that time, I was a strong believer that Valencia's promotion was long overdue. A year later, I have the same feeling. Although I believe the Twins' lethargic approach of moving Valencia through the organization is justified, I still would have wished this was done sooner rather than later. But regardless, the move has come and it's great to see him finally get another step closer to reaching the Major Leagues. Valencia is considered to be the "complete package" at third base, combining a good all-around bat and outstanding defensive abilities to a position the Twins lack depth at. The Twins have been priming Valencia to be ready to take over third base for the 2010 season, and with his promotion to Triple-A, that seems to certainly be what the Twins are aiming for. Joe Crede signed a one-year $2.5 million deal with the Twins at the beginning of Spring Training, giving the Twins one year of quality play at third base, something the ball club hasn't seen in the past few years. Although Crede's signing was full of questions, one thing that was seemed to be a certainty was that it was only a one-year deal, with seemingly no possibility of any extension after the season. Crede would benefit from proving to other teams that he was healthy, while the Twins would benefit by signing him to a low-risk, high-reward contract and filling the third base void for a year prior to another player stepping forward and claiming the position. The Twins really had two options to claim it, Luke Hughes and Valencia. Hughes abruptly emerged onto the Top Prospect ranks with an outstanding 2008 campaign where his slash line was .309/.369/.524 with 44 extra-base hits including 18 home runs while splitting time between New Britain and Rochester. Unfortunately, his defense could not follow suit and after given full reign to third base in Rochester, he never played good enough defense to even be considered a possibility to handle the position at the Major League level, leaving Valencia as the true one and only possibility. Thankfully, Valencia's defense has been great, despite a fair amount of errors at each level. Still, Valencia is a 'true' third baseman, while Hughes' 'true position' is still an unknown as he's his fair share of troubles while playing each position. He seems destined to be a corner outfielder in my mind, while I have little doubts over Valencia's ability to handle the hot corner. I've only seen Valencia play one time (on MiLB.tv), but he looked 'natural' at that position, as cliché as it may sound. Valencia began the '09 campaign hitting .269/.395/.463 through April before crushing the ball in May with a .373/.443/.667 hitting line. He made one adjustment in his swing, allowing him to hit the ball off the ground a bit more, which resulted in 15% less ground balls, 9% more line drives and 10% less infield fly-balls. It also helped him hit twice as many home runs as the previous month. Unfortunately, the success didn't continue as he got off to a terrible start in June hitting .115 until last week. Then, all of a sudden, something started clicking again and Valencia quickly broke out of his 6/51 slump and was 10 for his last 24 with two doubles and a home run before his promotion. Valencia will now be the everyday third baseman in Rochester, where the Red Wings could certainly use the help with the Twins tapping into the Triple-A depth (or lack thereof) early and often this season. Valencia will join Steven Tolleson as the second Rock Cat infielder to make the jump from Double-A to Triple-A, and they may not be the last. Brian Dinkelman has been Valencia's teammate in each level throughout their professional careers, generally being called-up at the same time. Dinkelman has also had a good '09 season, but unlike Valencia, he has yet to get out of his June slump. But I'm sure as soon as he does, he'll join Valencia in what's expected to be a very crowded, yet talented Rochester infield. Another move I wouldn't be surprised to see the Twins make is the promotion of Whit Robbins, who's having an outstanding season in Double-A, while releasing either Brock Peterson or Matt Macri. Macri currently holds a spot on the 40-man roster, whereas Valencia does not. Although Valencia doesn't figure to make it to the Big Leagues anytime this summer, other players such as Juan Morillo, Rob Delaney, David Winfree or even Kevin Mulvey do seem to be possible call-ups this summer and could certainly use a spot on the 40-man while Macri probably won't make it back to the Majors with the Twins. One thing to note over the next couple of days is this, Twins General Manager Bill Smith is currently in Rochester watching and evaluating the Red Wings. This move probably had a lot to do with that, which could allow Valencia to make a great impression. It could also make other moves more and more likely as Smith gets a better look at a team three games under .500. While many moves are expected to happen in the next few days, none may be as big as this. UPDATE (2:45 PM): It was in fact Luis Ayala who was DFA'd. We'll see if he accepts an assignment, but that's doubtful. Could this be the end for Luis Ayala or Sean Henn? According to Jim Mandelaro of the Rochester Democrat and Chronicle, the Twins have called-up Bobby Keppel after Saturday's bullpen blowup over the weekend. Sean Henn came into the game in the seventh inning with a runner on first base. He proceeded to give up the inherited runner with a double and then gave up two more runs on a Jason Michaels home run. The Twins would like to hold onto another left-handed reliever, which means Henn could be spared. Luis Ayala has struggled in recent outings and has again made it difficult to send him out during any sort of situation with any pressure as he's having trouble controling his sinker. Keppel is right-handed, which makes the speculation of Ayala being cut even more attractive. Keppel is 3-3 with a 2.43 ERA in 23 games this season. He was recently moved to the starting rotation after a request to the Twins organization. He has an opt-out clause in his contract, and he felt that starting would draw more interest from other clubs. In the three starts he's had since the move, he was 1-2 with a 2.57 ERA. The most interesting stat from Keppel's three starts is his K/BB ratio. From the bullpen, Keppel struggled with his control, striking out only 14 batters while walking 12. But as a starter, Keppel struck out 14 batters while walking just one. He's also had a 2.07 GB/FB ratio, which has undoubtedly helped bring his season ratio up to 1.91 GB/FB. In those starts, he's also thrown 61.4% of his pitches for strikes while only allowing one home run. Although he looks capable of starting, it doesn't sound as though the Twins are calling him up as a starter. Even with Kevin Slowey currently hurt, the Twins seem more interested in fixing their bullpen than to replace Slowey. The Twins bullpen has pitched better in the last month or so, but it still is far from being up to the Twins' standards. Henn or Ayala seem to be the most logical of players being cut, a few other players could also make sense as well. Matt Tolbert has been absolutely atrocious this season. He's currently 0-12 in his last four games, bringing his season slash-line down to .168/.261/.228 in 101 at-bats. As much as Ron Gardenhire likes him, it makes little sense to keep him on the roster when he's playing this poorly. We already have one Nick Punto on the roster, we don't need two. Jason Pridie was called-up after Denard Span was placed on the disabled list last week. The Twins are currently hoping that Span can come back later this week, meaning Pridie's current stay in the big leagues is winding down fast. The only action he's seen thus far is as a pinch runner. With the Twins going to two National League ballparks in the next week, the Twins will already have one outfielder on the bench at all times. It's seems unlikely Pridie sees anything more than a pinch running or defensive substitution from here on out. Finally, Jose Morales could make sense to be sent out. I know this is probably the least likely to happen, but it doesn't make sense to me to have Morales sit on the bench the entire time he's up here. I thought he'd get a start on Sunday, but Mike Redmond, who's arguably having the worst season of his career, started in his place. Morales has played great in his short stints in the Major Leagues, and seems to be the best option to fill Redmond's spot next season, but he does need to play. If the Twins can't work Morales in, more than just a pinch hit here-and-there, then I think he could also be sent back to Rochester. The three position players I just mentioned do have an advantage over either relievers right now, making their demotions more unlikely. That advantage is that the Twins are currently set to embark on a nine games in nine days road trip, with six of those games coming against National League opponents. That means that going back to a 12-man pitching staff right now, is highly unlikely. But I do expect all three of those players to be sent down sooner rather than later. Heading into the 2008 MLB Draft, the Twins had a few options at the #14 pick that had fans hemming and hawing over what the Twins should do. Some fans believed a power arm such as Christian Friedrich would be best suited, especially with an organizational deficiency of left-handed pitching. Some also thought that an infielder like Casey Kelly or Conor Gillaspie would fit the bill. Regardless of who the Twins drafted, they needed to be an impact player. So when the team selected Aaron Hicks, arguably the best athlete and outfielder in the draft, everyone got really excited and things suddenly started looking up for the Twins minor league system. Although that may sound cliche, there's no doubt that while the Twins farm system is still very well respect, it didn't have nearly the quality of young talent it used to have. Hicks, by all means, won't single-handedly change that, but he is viewed by many as the most talented player in the organization, despite only playing only two months of professional baseball. The wiry 6'2'' 170 lbs. outfielder has drawn comparisons to Torii Hunter, Darryl Strawberry and Adam Jones (among others). Any by all means, that's a great group to be compared to and I personally think they're all very realistic. At just 19-years-old, Hicks has separated himself from those players mentioned above in that he has showcased something that all three players mentioned above lacked when making their jump from high school to the pro ranks. That would be plate discipline. Hicks' approach at the plate is just one of the many tools he demonstrated in his first 45 games of professional baseball. It was a major part of the reason why his OBP ranked 8th and overall OPS ranked 5th in all of the GCL in '08. The switch-hitting 18-year-old also his 18 extra-base hits, including four home runs, as well as stealing 12 bases. "...the average hitter has produced a measly .254/.333/.357 line (in the GCL) this season." Although the Twins aren't concerned about how other players in other organizations are doing when promoting their own players, it did give Twins fans even more reasoning as to why Hicks should have been in Beloit at the start of the 2009 season. Despite being only 19-years-old, Hicks is viewed as one of the best athletes in Minor League Baseball. Although being athletic doesn't prove anything to anyone about being a good baseball player, Hicks has shown the Twins, even in a short period that he is a pretty damn good baseball player as well. While drawing rave reviews with his bat from both sides of the plate, there is another aspect of Hicks' game that has given fans reasoning to call for his promotion to Beloit, and that is his glove. Hicks was listed by BaseballAmerica.com as being the best defensive outfielder and also having the best outfield arm in the Twins' system. Hicks was a pitcher in high school, hitting the mid-90's on the radar gun, and was scouted by some teams as a pitcher instead of an outfielder, which is one reasoning for his outstanding arm. The reason that many fans look to this for reasoning to promote Hicks, is because 2007 first round pick Ben Revere was also kept back in Extended Spring Training at the beginning of his second year in professional baseball. Despite also being a good athlete, Revere was being held back due concerns over his defense. Revere, like Hicks, lit up the box scores while playing in the GCL, but didn't show nearly as much potential at the plate or with his glove as Hicks did. It eventually took an injury to D.J. Romero for Revere to make the Snappers roster, and we all know how the rest of his season went. Revere's success in '08, Hicks' expectations, and his impressive plate discipline along with strong defense were all reasons fans were giving as to why Hicks should be in Beloit. Yet the Twins wanted to use their newly-modeled conservative approach with Hicks (like they wanted to with Revere), and let Hicks take his time and go to Extended Spring Training while heading for another go-around in Rookie Ball. But the time has finally arrived for Hicks to make head to Beloit, albeit later than Twins fans had hoped for. "Geez, this is Little League for him." Although saying he's the best prospect since Joe Mauer (or even Jason Kubel) is even too much for me (to speculate on) right now, it's certainly what many a lot of fans are thinking and the Twins just have to hope that aggressively (at least to Twins standards) promoting Hicks like they were forced to with Revere will work out like it once did for Mauer. • The Twins beat the Pirates yesterday by a score of 5-1. Twins starter Nick Blackburn won the "Battle of the Aces", outdueling Pirates starter Zach Duke to pick up his 6th win of the season. Even without Joe Mauer, the Twins offense still mustered up some punch with their bats. Brian Buscher and Michael Cuddyer both hit home runs, while the team combined for six extra-base hits. It was Buscher's second home run of the season while Cuddyer joined Mauer, Justin Morneau, Joe Crede and Jason Kubel in the double digits with his tenth of the season. Brendan Harris went 3-4 while Cuddyer and Nick Punto also had multi-hit games. All together, the Twins collected ten hits on the afternoon, seven of which were against Duke. • Tonight, the Twins play host to the Houston Astros. The Astros currently sit at the bottom of the National League Central standings and will send Roy Oswalt to the mound against Kevin Slowey. First pitch is scheduled for 7:10 pm (CT). • Seth Stohs posted his most recent post at the Your Voices page on the Minneapolis Star-Tribune website has to do with Bert Blyleven and Bingo. Stohs did leave off two which quite frankly are my most irritating Bertisms: Uppercut Swing and Tim Wakefield. Blyleven has a tendancy to mention Tim Wakefield and his "much slower knuckleball" at least 10-30 times whenever R.A. Dickey is pitching. Drives me nuts!I guess cat-like instincts would be up there too, but he's gotten away from that just a bit. But regardless, it was a very creative post and I think it will be a hit! • Thrylos from The tenth inning stretch takes a look at whether or not the Twins pitching staff has improved and uses the Pitching Effectiveness formula that he created to take a more in-depth look at both the bullpen and rotation from month-to-month. • The Fort Myers Miracle clinched the first-half of the Florida State League and will make another trip to the FSL playoffs later this summer. After the Florida State All-Star game, which is this weekend, the Twins will likely be making a few roster moves, likely moving a few players around. Perhaps Ben Revere (who's hitting .325/.398/.375 with 27 stolen bases) or David Bromberg (who is 5-0 with a 2.22 ERA and 62 strikeouts in 69 innings) could be among the players that make the move from the FSL to the Eastern League? I know it's a long shot, but both have played exceptionally well. But they'll more than likely have to wait until next season to get a shot at Double-A. • Speaking of minor league roster moves, quite possibly the biggest move of the season so far was announced yesterday. Twins 2008 first-round pick Aaron Hicks has been placed on the Beloit Snappers roster, despite spending all of this season in Extended Spring Training. The original plan was for Hicks to play in Elizabethton this season, meaning he'd have to wait until 2010 to make it to the Midwest League. Hicks, however, forced the Twins' hands and with the Snapper's playing attrociously bad, they finally felt the time was right to bring Hicks up from Ft. Myers. Hicks will (for the most part) luck out on any bad whether in Wisconsin, which I'm sure will make the California boy happy. • Seth Stohs and Josh Johnson both take a look at Hicks' promotion. • Finally, Dave Cameron from FanGraphs.com (and U.S.S. Mariner) takes a looksie at the decision to plug Brendan Harris into shortstop, when Nick Punto is the more quality defender. Although I think that from a defensive standpoint, this makes sense it's kind of like "jamming a square peg into a round hole" but Gardenhire has stated numerous times that Harris is a more "natural" at shortstop than he is at second base, despite not having the range to handle the position effectively. Harris also doesn't seem to be as comfortable at second base, as he is at shortstop, which he's carried over with him offensively. First thing's first... Yesterday, I had a post ready to be posted and for some reason decided against just waiting until 12:00 am Wednesday to post it, I decided to schedule it to be posted at 5:00 am. Silly me, I didn't even realize that the article was never actually posted (accidentally had it set to go at 5:00 pm, instead of am), which is why there was never a post up yesterday. And since it was about Tuesday's game, I figured that it's probably worthless to even post it. That's just a "my bad" on my part. • Glen Perkins came off of the disabled list on Tuesday, meaning someone had to be taken off of the roster. Speculation grew that one of Denard Span or Michael Cuddyer would land on the disabled list otherwise catcher Jose Morales would be sent back to Rochester just days after being promoted. But none of those things happened. Instead, the Twins made a surprise move by optioning struggling relief pitcher Jesse Crain to Triple-A Rochester. Crain is in his 6th year with the Twins, which made people question whether or not he had any minor league options remaining. Obviously he did and will now try to get back on track in the minor leagues. Crain was drafted in the 2nd round of the 2002 draft. He spent the majority of his time in the minor leagues as a closer, as he was primed to be the ‘closer of the future’ after Eddie Guardado’s tenure with the Twins was finished. Joe Nathan derailed those hopes and dreams, but Crain successfully found himself as one of the more reliable Twins relievers and was an integral piece to a respected Twins bullpen. Crain’s career took a big hit in 2007 after he was diagnosed with a torn labrum and torn rotator cuff. The surgery to repair these injuries has been regarded as the death to pitchers, as it has a very, very low recovery rate. Crain missed moss of the ‘07 season, but surprisingly returned in ‘08 and put up fairly successful numbers. Everything was looking great for Crain this Spring, he was primed to breakout and rightfully claim the 8th-inning setup-man duties. Unfortunately, he was never consistent and continuously found himself in trouble, trouble that he created himself, not the kind of trouble he was used to handling when coming into the game in a high-pressure situation. Some have given their thoughts on Crain, some think he’s injured, while other’s just think he’s lost his approach to retire left-handed hitters, but the Twins are hoping Crain’s just in need of a wake-up call, something they’re currently going through with infielder Alexi Casilla. With Crain’s slight drop in velocity this season, it’s hard not to wonder if he’s injured. But it can also be him just not trusting his stuff, which has effected his performance, which has effected his confidence. Confidence could also be his problem when facing left-handed hitters, which is something he’ll definitely work on with Bobby Cuellar in Rochester. Perkins came back strong in his debut, giving the Twins six inning of two-run ball to pick up his first win since April 19th. • After the game, the Twins placed Denard Span on the disabled list with an inner-ear infection. He left the Twins in the midst of their 10-game road trip with another spell of dizziness, last week, so the move didn't come as a surprise. Span first experienced the symptoms in May, causing him to miss a few games at the time, but he thought the symptoms had subsided. After another spell, the Twins took the time to figure out exactly what is wrong with him. The infection is usually something that lasts only a few weeks, so the Twins are hopeful that he'll be able to return to the big league's when he's eligible on June 25th. In the meantime, the Twins called up Jason Pridie from Triple-A Rochester to take his spot on the roster. Pridie's season has been nothing short of a disaster and he's likely here to just fill in and either pinch run or play defense in late-inning situations. Delmon Young, Carlos Gomez and Michael Cuddyer should continue to receive the bulk of the starts, with maybe an off-day here or there. Pridie has hit .255/.285/.333 at the top of the Red Wings order this season, and continues to swing at just about everything that is thrown at him. He does have ok power and utelizes his speed well, but he really needs to get on-base more. Pridie will be optioned to Rochester when Span returns and probably won't see anything more than one or two starts and a few pinch-hitting and defensive substitution appearances when he's up. The Joe Mauer power surge has a lot of people giving their two cents. Some say it's a result in a slight change in his swing, some say he's gotten stronger, and yet he says that nothing has changed at all. 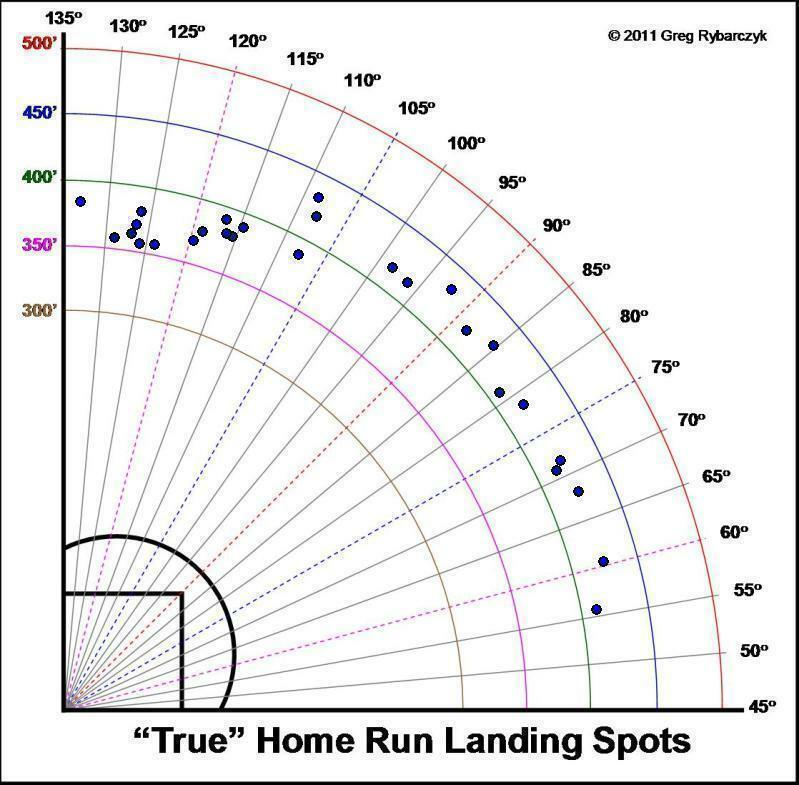 One thing that is specifically eye-opening is that out of his 13 home runs, 9 have been hit to opposite field. The problem many people are still having, is that he's barely clearing the left field fence with his hits, which is making some people suggest that he'll eventually begin hitting more pop-ups as the season progresses. While we won't know for sure if that will happen for sure, one thing that is already known is that Mauer will definitely love the dimensions of Target Field. The left field wall at Target Field will be 339 feet from home plate, four feet shorter than the left field wall at the Metrodome. While four feet doesn't seem like a lot, if Mauer continues to drive the ball towards that side of the field, he should be able to collect a few more home runs over the course of a season. How many? I doubt very many, but a few. Already this season, Mauer has hit two balls to left field that would have been home runs, if he were playing in Target Field. One was a home run that was robbed by Clete Thomas and another was a double that came against the Kansas City Royals in just his first game of the season, it would have been his second home run of the game. Obviously I'm not taking a few things into effect, some of which would be a negative and some of which could be positives. I haven't mentioned the hits to right field or to right-center, the positive/negative effect wind will have on the ball, and I'm also not taking into effect the number of "would have been" home runs he's hit on the road. But with all of that said, is it that hard to imagine him hitting 4-5 more home runs because of just a few feet? The first three rounds of Major League Baseball's First Year Amateur Draft is now complete, and while pitching was thought to be the hottest commodity early in the draft, the difference between hitters and pitchers selected were 56-55 in favor of pitchers. There was one glaring difference though. Out of the first 111 picks of the draft, 37 were college pitchers opposed to just 19 high school arms being selected. That was a much bigger spread opposed to the 30-25 differential between high school hitters and college hitters, which favored prep hitters. The Twins did their part by contributing to the theme of selecting college pitchers by drafting four collegiate pitchers with their first four picks. There was talks leading up to the draft that the Twins would take arms early, but I don't think anyone was expecting them to take them at this magnitude. With the Twins top prospect lists starting to slowly turn into a heavy list of offensively-gifted hitters, pitchers were something the Twins knew they had to take early on. And they wasted no time when selecting the 22nd pick of the draft. Kyle Gibson was the one of the most talented pitchers and was highly touted heading into the draft. In fact, the University of Missouri product was as recently as last month considered a top five talent. In a May 30th start against Monmouth, Gibson experienced forearm tightness in his arm after throwing 102 pitches over eight innings. Gibson's velocity on his fastball generally sits in the low-mid 90's, but in this start it was averaging between 83-86 mph. Despite not allowing a run, Gibson knew something was wrong and an MRI later revealed a stress fracture in his right forearm. Stress fracture injuries are tricky. It usually is an underlying to a more pressing issue. For instance, the injury definition can give some thoughts as to why the injury occurred. Stress Fracture: a fracture caused by unusual or repeated stress on a bone, such as with soldiers or athletes. That should give readers somewhat of an an incite as to how Gibson acquired the injury. Gibson's workload was a cause of concern all year, even before his injury. Gibson threw five complete games this season, and in 1,566 pitches through 15 starts. If you're doing the math, that's an average of 104.4 pitches per start. He also made a relief appearance where he threw 15 pitches in an inning of work. Obviously, there's no doubt over the amount of work Gibson endured this past season. Stress Fractures are also indicators of low bone density, although that's not as common in men as it is in women, as well as muscle fatigue. Muscular fatigue really jumps out. After all, this start when the symptoms reportedly began came on May 30th, 16 games (15 starts) into his season. There's no doubt this was probably a major factor. The repetitive muscle pulling in his forearm and elbow eventually got the best of him and the ulna bone in his forearm eventually fractured. Thankfully, this injury is not considered to be very serious but he'll need to rest for the next 5 weeks with some light exercises beginning between weeks 6-8. Best-case scenario: Gibson is put into a cast for the next 5+ weeks and after another two-three weeks of strength-building exercises, he returns to the mound in mid-late July. Worst-case scenario: Gibson's fracture doesn't completely heal and eventually needs surgery which will knock him out for about six months. There's really nothing the Twins can do at this point, which is somewhat frustrating. But while the it may be most frustrating when other teams' top picks are hitting the diamond for the first time, they'll have to sit and wait to see Gibson finally take the mound. But it could pay dividends for the Twins, who haven't picked a pitcher with their first pick since 2005 (2006-2008, the first player chosen was an outfielder). Other than the potential, there is one more underlying positive for the Twins. With this injury, he does lose some leverage in contract negotiation. Although he could eventually reconsider and head back to Missouri for his senior year, he'll likely accept whatever the Twins are willing to pay him, which I'm sure they won't be a low ball offer. Remember, the Twins signed their 22nd overall selection in the 2004 draft, Glen Perkins to a $1.425 million deal. Fortunately, that numbers has been at the high scale in that draft slot, which means it hasn't gone up since then. The Twins might be able to sign Gibson to a signing bonus around $1.3 million, which is slightly below the $1.37 million average for the 22nd overall pick since 2003. Gibson is a physical specimen. Standing 6'6'' and weighing 208 lbs., there's no doubt that his size projects well into the pro's. Although his overall frame is wiry, he does leave room to bulk up. He has two plus-pitches; a low 90's sinking fastball and a hard 10-4 slider that registers in the low-mid 80's on the radar gun. He also has a change-up which could some day also be considered a 'plus pitch'. Most importantly, while mixing up his pitches, Gibson maintains impeccable control which fits the mold of Twins pitchers. Through 261 innings at Missouri, Gibson has walked only 61 batters while striking out 304. His K:BB ratio is 4.98 while his K:9 is 10.5. His BB:9 is a very solid 2.10. Those aren't Kevin Slowey-esque, but they do remind me a lot of Scott Baker. Gibson and Baker are both similar pitchers with similar builds. Gibson's ceiling is higher than that of Baker's although both project to be #2-3 starters. Gibson, like Baker, probably won't need a ton of time in the minor leagues. Despite being only 21-years-old, Gibson could probably start in the Midwest League this season and make his way to the Florida State League at the beginning of the 2010 season. Missouri has produced a few very good pitchers over the past few years, most notably Max Scherzer from the Arizona Diamondbacks. Hopefully Gibson can follow in Scherzer's footsteps and manufacture the same success. Every year, there's a ton of draft day banter that really proves to be worthless as the MLB draft is easily the hardest to predict. Every team has a different agenda and with a player never ready to step in and play at the highest level out of the draft, unlike in the NBA or NFL, the smallest thing such as a few extra dollars or college scholarship can sway a team to go a different direction when drafting a player. Davidson for some odd reason stands out to me the most over any other hitting prospect in the draft. At least, realistic as relative to the Twins' 22nd pick. Davidson has a great body frame as he's listed at 6'4'' and 225 pounds. Having seen video on him, I came away impressed with his power and overall approach at the plate. He won the Home Run Derby at the 2008 Aflac All-American game, using a wood bat. Davidson has been said to have struggled with his conditioning, as he jumped a reported 20 pounds between Sophomore and Senior year, but he's also been said to have a great work ethic, so I'm confident he'll be able to get to a comfortable weight. His bat does the talking, but he's no slouch defensively either. If he is able to maintain his weight, he should be able to stay at third base throughout his career. Although he doesn't project as a Gold Glover, scouts feel he'll be able to fill third base adequately. The most impressive thing I've noticed from reading up on Davidson is that he comes away very humble. He not only excels on the field, but also in the classroom and in the community as well. I think he'd be a great first round pick for the Twins, but I'm sure he catches my eye more than he catches the Twins'. The Twins drafted Mitchell back in the 10th round of the 2007 draft. He was a first round talent, but scouts were weary of drafting him due to his commitment to play football in the fall with SEC powerhouse LSU. After a lackluster football career, it looks like baseball may be the way to go for Mitchell. Mitchell is in the mold of Denard Span, which is great, but probably not what the Twins are looking for with their first round pick. The Twins have also taken an outfield with their first round pick since 2006, and have drafted seven outfielders in the first five rounds since '06, signing six of them. Mitchell has outstanding speed, and draws a lot of walks. He also generates quite a bit of power despite a 5'11'' 190 lbs. frame. The negatives on Mitchell is that he also has struck out an average of about 33% of the time this season. I personally don't see the Twins drafting an outfielder with their 22nd pick and I really doubt Mitchell will be available when they pick again with the 46th pick. Drafting Mitchell would also break the mold of drafting a college hitter instead of a high school hitter in the first round. They haven't drafted a high school hitter in the first round since Travis Lee with the 2nd overall pick in the 1996 draft. Gibson is known as one of the best college arms in the draft. He has a great body frame and has excellent command on all the pitches in his repertoire. His 6'6'' 225 lbs. frame makes him very projectable. Although he doesn't have the high velocity that former teammate Aaron Crow has, Gibson comes over as more of a "Twins guy" as he works everything off of his fastball. He compliments his fastball with a good slider and improving change-up. There is one big red flag with Gibson right now. He currently is injured with a stress fracture in his forearm and will be out until at least the middle of July. With that said, the Twins could benefit by drafting Gibson and paying him a lower signing bonus. But with that said, the Twins may be well advised to stay away from Gibson as he's one of the 'workhorses' at the college level, averaging 14.8 pitches per inning. Gibson's stock has plummeted and I don't know if the Twins will take the risk of drafting him. Scheppers if you can recall, Scheppers was drafted in the second round of the 2008 draft by the Pittsburgh Pirates. Thought to be a sure-fire first round pick, Scheppers saw his draft stock fall due to a stress fracture in his shoulder. In turn, he fell to the second round where the Pirates thought they were getting great value. Unfortunately, Scheppers priced himself out of the Pirates plans and instead turned to pitch in the Independent League with the St. Paul Saints instead of returning to Fresno State. It was the second time Scheppers turned down a contract, as he was originally drafted in the 29th round of the 2005 draft by the Orioles. Scheppers is 22-years-old and has handled the conversion from shortstop to pitcher well over the past few years and now features a mid to high 90's fastball as well as a slider, change-up and curveball. Both curveball has been said to be average while his fastball and slider are considered 'plus' pitches. His change-up has improved a lot and is considered to be above average as well. Although Scheppers has been thought to be a top 10 pick again this season, but some recent mock drafts have projected him to slide over teams still being concerned over his shoulder. I doubt Scheppers is still on the board when the Twins draft, but if he is, I really hope the Twins take him. For more on Scheppers, make sure to read Brian Pietrzak from the Minnesota Twins Examiner. Pietrzak has given a few updates on Scheppers in the last month or so. Note: Like I mentioned above, the Twins haven't selected a high school pitcher in the first round in a while. In fact, the last high school pitcher drafted by the Twins in the first round was Dan Serafini back in 1992 (CORRECTION: Kyle Waldrop was selected in the first round by the Twins back in 2004 out of High School... I got mixed up as the Twins had three first round picks that year. Also, Jay Rainville was also selected in the supplmental first round). James has a great fastball with a developing curveball and change-up. He's definitely a work in progress and will take time to develop, but the lack of left-handed pitching throughout the Twins' system could give the Twins motivation to take a southpaw early. I don't see Tyler Matzek or Zach Minor on the board at 22, that leaves Rex Brothers and Andrew Oliver as the only other left-handed college pitchers worth taking in the first round. That means the Twins may have to go to the prep ranks to take the best southpaw available. Hobgood has been a very common pick throughout Mock Drafts for the Twins. I also like him, but as I mentioned, the Twins have a lack of left-handed pitching throughout the system and I'd prefer to go this route. But honestly, it all comes down to who the Twins believe has the better future. I have heard some compare Hobgood to last year's 6th round pick B.J. Hermsen. Both Hobgood and James project to be top-of-the-order starters but Hobgood seems a bit more polished. Although most say "take the best player available" which I'm also an advocate of, the Twins may still rank James a bit higher based on need. Most believe James will be taken between the Twins' first round pick and supplemental-round pick, while Hobgood is projected to be gone at some point in the first round. Note: I would have listed Marisnick above in my "players that intrigue me" section, but I figured it'd be best just to write about him one time. Despite taking outfielders at a high-rate over the past few years, the shallow depth of hitters in this draft could make the Twins reach high for a hitter. Marisnick is all about projection, as his 6'4'' 200 lbs. frame gives people hope he'll one day mature into an above-average hitter. There have been comparisons to Torii Hunter, but some of that has to do with his adviser being Larry Reynolds, Hunter's agent. However, the same mixed scouting report came up when Hunter was being drafted: questionable hitting. While Marisnick prides himself on playing good defense, like Hunter does, his bat has raised question marks due to inconsistency and overall approach. I don't see what all the fuss is about as I've seen video of him having a good all-around bat. But again, I'm no scout and watching highlight videos doesn't show the whole story. Still, Marisnick has great potential in his bat and could be a steal if he falls to the Twins with the 46th pick. He's a personal favorite and I'd love to see the Twins draft him. And even better, I think it makes sense. Note: This is probably the biggest stretch, but Dominguez's big questions on defense will have scouts' opinions on him a little up in the air. He has the body-type of Miguel Cabrera but also carries the bat potential as well. Ok, maybe I'm a little too generous with a Cabrera comparison, but he does have a great bat. Dominguez has hit 46 home runs combined from 2008-2009 compared to just 15 in his freshman and sophomore years (although keep in mind, he only played in 3 games in his freshman year and didn't record a home run). If the Twins are given the gift of Dominguez falling into their laps, they'd be silly not to take him. He projects to be a fast riser based on offensive potential, even though he'll probably be held back a bit due to his defense. Note: I know, I know. McCallum's name has been all over the place in the last couple weeks, primarily linking him to the Twins as an early draft consideration. McCallum is one of the biggest draft risers after a great junior year in the Big Ten. He hit .406/.484/.741 with 38 extra-base hits including 18 home runs this season. He also did so while playing OK defense. The biggest concerns are whether or not McCallum will be able to stay at second base or if he'll have to move to left field or right field. He has fielded second base well in the past, but usually shortstops are drafted and later moved to second base. Hopefully McCallum's 2009 season wasn't just a mirage as his Freshman and Sophomore years weren't very impressive. Still, the Twins love drafting homegrown talent and McCallum will be high on their draft board. Who do you have the Twins drafting? Am I completely clueless? Too optimistic? Time will tell. I do hope that the Twins end up with at least one good pitcher but also continue to draft highly-touted hitters. Despite the top 10 prospects in the Twins system slowly becoming populated by hitters, there is still a good amount of quality pitchers throughout the system. A full scale system of tracking batted balls off the bat and all the way to the fielder’s gloves will allow us to make massive strides forward in fielding metrics and even assist us in refining our offensive measurements as well. The announcement of HIT f/x was first announced back in January. So yesterday, when Carruth gave us a little taste to what a HIT f/x would entail, it was obviously very exciting. The stat was the initial speed off the bat. And I did make one observation. The New York Yankees who have are tied for second in the Major Leagues with 88 home runs. Yet, they a 14th in baseball with an 80.9 mph initial speed off the bat. Meanwhile, the Giants who as a team are last in the Major Leagues with 28 home runs, are tied for 15th in baseball with an 80.7 mph initial speed off of the bat. And when you take in effect the average mph that is being brought down by the pitchers, as the Giants and other National League teams' average will be down, it's really eye-opening to how the field dimensions could play in effect. However, the field dimensions at both AT&T Park and Yankee Stadium aren't all that different, which really just brings up that the Yankees pay for their power, while the Giants pay for their pitching. It's even more eye-opening when you see that the Giants are over .500 despite being second to last in runs scored. What does all this mean? Nothing really. I just thought it was interesting and thought I'd pass it along to the readers here at Josh's Thoughts. Some may have seen the rant-filled column by Patrick Reusse's in the Sunday Minneapolis Star-Tribune sports section. I obviously did, and I really haven't stopped thinking about it since I read it. Back in 2006, Reusse claimed that Johan Santana would not re-sign with the Twins because of the deal Barry Zito was rewarded by the San Francisco Giants. Although he was right about the outcome, to say that fans today are getting too worked up, too early over the thought of Joe Mauer leaving is kind of absurd and to a point, hypocritical. Santana was traded just over a year after Reusse wrote that column. In other words, just over two full years after Santana would have been a free agent. Now, just a year-and-a-half before Mauer is set to become a free agent, Reusse is singing a different tune regarding the chances of signing yet another beloved superstar. Obviously every player's situation is different. Santana's will to stay with the Twins may not have been as strong as many had thought (or hoped). But the fact of the matter is that if the Twins tried to sign Santana to an extension prior to the 2007 season, before the rift with the front office started, we may already have a Opening Day starter for 2010 penciled in. But the Twins front office waited, and they waited too long and they eventually had to trade Santana. But just imagine if the Twins tried to re-sign Santana before Zito inked that deal, could the reported 4-year $80 million extension been enough? Probably not. But it probably wouldn't have taken the Twins the $136.5 million to sign him that it took the Mets a year later. Unfortunately, we'll never know for sure. Twins fans had clamored for the Twins to re-sign Santana to an extension before Zito inked his deal. Instead, the Twins sat back and let the cards play out. That meant the Twins dealing Santana just a year later. Mauer, like Santana, is a special breed. He's 26-years-old and is having an MVP-like season, despite playing in only 34 games this season. He also plays a premium position that is hard to fill, yes, even harder to fill than as a staff ace. Catching is the most demanding position in baseball and when someone 'special' comes around, teams will be chomping at the bit to get their hands on him. Just look at Mike Piazza, at the elderly age (for Major League catchers) of 37, he still inked an $8.5 million deal with the Oakland Athletics. That should give people some thought as to how much teams will pay for a catcher. So with teams like the Yankees, Red Sox and Mets soon-to-be looking for even a serviceable catcher, there's no wonder why Twins fans are frightened by the thought of Mauer getting close to free agency. I do believe the Twins will re-sign Mauer. No, not just because he's a hometown hero, but because the Twins won't let yet another big-name player leave via free agency, at least not this soon after the loss of Santana and Torii Hunter. Everyone brings up Kirby Puckett and his deal, which at the time was a big thing, but the Twins have let quite a few players leave since due to salary demands. But even though I do believe he'll re-sign, is it really that wrong to start getting worried about it now? After all, it essentially took one pitcher, one bad move by the front office and a little too much time to really make Santana a 'goner'. Victor Martinez is due for a contract, and although he may not be a long-term fit at catcher, could he drive up the price? I doubt he'll inflate the asking price to the point of Zito, but with the season he's having, you'll never know. Five weeks after Mauer's return to the lineup, the mantra has changed: The Twins messed up by not signing Mauer to a long-term contract last winter, with two years left on his deal from February 2007. They will never get a deal done with him now and it's inevitable that Mauer will be with the Yankees or the Red Sox in 2011. This angst over Mauer's future with the Twins is premature by six months, minimum. I wonder if the Twins would go back prior to the 2007 season, with two years left on Santana's contract, and re-sign him to a long-term contract then. It probably would have ensured that Santana would be in a Twins uniform today, anchoring down a struggled rotation. But instead, Twins fans are wrong for getting too worried over Mauer, when we're actually past that point in his contract. And lets say the Twins do wait six months, that's right about the time they realized that it would be damn-near impossible to re-sign Santana and were (in a way) forced to trade him. In other words, they over played their cards and waited too long. But why even let it get to that point? But I guess Reusse is right. After all, he doesn't use "make-believe stats" like other "people with baseball observations that are neither bright nor original." When the Midwest League All-Star rosters were announced yesterday, I was expecting to see a few Snappers. Despite hoisting a league-worse 18-35 record, the team does feature a few really good players some of which are having exceptional seasons. As I looked at the list, the only Snappers player I saw was Joe Testa. The 23-year-old left-hander signed as a non-drafted free agent prior to the 2008 season after a four-year career at Wagner College. This is his first go-around in the Midwest League and is impressing people with his repertoire of five pitches. He throws his fastball in the low 90's but has kept hitters off-balance with a good change-up, curveball, slider and cutter. He has posted a 1.07 ground ball to flyball ratio and has only given up 19 hits on the season for a .151 average against. Having already had his cup of coffee in the Florida State League last summer, he'll likely be back there after playing in this All-Star game. But theres's one player that stands out to me that I thought was a sure-fire All-Star selection. Ramon Santana is hitting .355/.431/.570 with 15 extra-base hits on the season. Although none of those statistics are league leading, his 1.001 OPS would be. The only thing holding Santana back is that he's a handful of at-bats away from qualifying for the league batting title. He missed a couple weeks with a left ankle sprain at the end of April/early May and for that reason may not be qualified to make the roster. If that's the case, I understand, but really can't say that I agree with it. He's currently just a handful of at-bats away from qualifying and should be qualified by the time of the game. Obviously the voters can't take that into effect, since he could miss time between now and then, but that's the only conceivable reasoning I could come up with that Santana isn't an All-Star. The Florida State League announced their All-Star rosters yesterday. The Fort Myers Miracle currently are in first place of the FSL South division, so it's no surprise that seven Miracle players made the roster, tied for the most of any team (most in the South). Ben Revere obviously made the team. 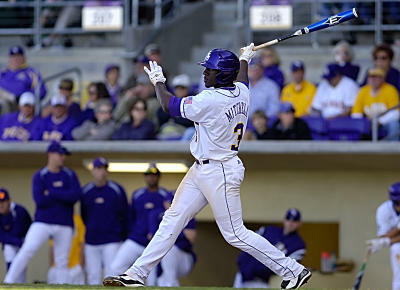 The Twins first round pick in 2007 is now hitting .342/.408/.400 with eight extra-base hits and 22 stolen bases. His batting average is now first in the league after the promotion of Yankees catcher Jesus Montero. His 22 swipes are third in the league. His on-base percentage is also third in the league. Chris Parmelee will join Revere in the lineup where he was chosen as the only designated hitter on the roster. Parmelee is hitting .244/.323/.384. His five home runs are a team high as are his 20 walks. He hit .303/.394/.438 in May but has only one hit in 14 at bats in June. Joining Revere and Parmelee in the lineup will be infielders Chris Cates and Steve Singleton. Neither have put up great numbers this season, but to their credit, the talent pool of middle infielders in the Florida State League is pretty shallow. The 5'3'' Cates is hitting .276/.327/.322 with five doubles and a triple to go along with 15 RBI. Singleton is hitting .233/.308/.350 with 14 extra-base hits and 20 RBI. Both Cates and Singleton may be drawing attention with their above-averae plate discipline. The two have a combined walk to strikeout ratio of 28:27. Two pitchers also made the roster. David Bromberg is the only starter who made the roster while Spencer Steedley made it as a reliever. Bromberg is 5-0 with a 1.94 ERA on the season. He has struck out 42 batters in 51 innings this season. 7.4 strikeouts per 9 innings is down from his 10.6 strikeouts per 9 innings that he posted last year. He continues to struggle with his control, but despite an average of 4.1 walks per 9 innings, he has a 1.18 WHIP. Steedley has been very impressive this season. The 24-year-old southpaw is 3-0 with a 0.74 ERA. The former 49'ers starter (UNC-Charlotte, not the team by the Bay) has a 25:7 strikeout to walk ratio and has a 1.07 WHIP in 24 1/3 innings pitched this season. He'll likely be promoted after the All-Star game, following the same route that the Twins have chosen for many other All-Star selections in the past. Danny Lehmann also made the team as one of three catchers on the team. Lehmann, like Parmelee, Singleton and Cates, doesn't have outstanding numbers, but that didn't stop him from making his second All-Star selection. Lehmann is hitting .286/.344/.339 with just three extra-base hits. But like Cates and Singleton, Lehmann has a good plate approach and has a 6:7 BB:K ratio. And finally, the Miracle's 2008 season is still paying off. The Miracle coaching staff will coach the South roster after making appearing in the league finals last fall. It should be a nice and relaxing game for the Miracle as the game will be played at Hammond Stadium, home of the Miracle. The game is June 20th. Extras: Each player selected to the All-Star roster were also Midwest League All-Star selections last season except for Parmelee. Carlos Gutierrez also made the roster, but following his promotion to Double-A New Britain, he won't be available. A day after we learned that Rob Delaney was being promoted to Triple-A Rochester, Seth Stohs of Seth Speaks reported that the Twins have promoted two more pitchers to different teams. 22-year-old Carlos Gutierrez and 21-year-old Alex Burnett will head to New Britain to give the Rock Cats 24 active players (12 pitchers). Both right-handers have had their roles switched from a year ago, but both are seeing great success. This move is somewhat surprising to do the Twins' reluctance to move other (deserving) players throughout the system. But that's not to say both players didn't deserve the promotion. Because on the contrary, both did deserve it. Burnett has been in Ft. Myers since the start of the 2008 season. Although he's been young for his level of player throughout his career, he's managed to put up good numbers. He's 27-20 with a 3.48 in 441 2/3 innings pitched. Burnett was drafted out of Ocean View High School in California. He throws a fastball in the low-90's and also features a curveball and change-up. He has handled the transition to the bullpen well this season, posting a 1.99 ERA with 26 strikeouts in 22 2/3 innings pitched. He spent the majority of the season as the Ft. Myers Miracle closer and has maintained his good control despite the transition. He also sports a great 1.96 FIP. Burnett doesn't light up the radar gun, but he may have a brighter future as a reliever than as a starter. In his first appearance in Double-A, Burnett came into the game with a runner on second base and one out. He then made both Connecticut Defender hitters strike out swinging to end the inning and help keep the Rock Cats within one run. The Rock Cats later scored two runs in the top of the 9th inning to steal the win, thanks in large part to Burnett. Gutierrez is quite different than Burnett. He is a college pitcher in just his second season of professional baseball (first full season) making the transition from reliever to starter. He also throws in the high-90's and doesn't feature the same caliber of secondary pitches that Burnett does. And while Burnett induces more groundball outs opposed to flyball outs, it's not nearly as large of a margin as Gutierrez. Gutierrez induced 103 ground balls this season opposed to just 23 flyball outs which gives him a 4.48 GB/FB ratio. That's quite a bit higher than Burnett's 1.33 GB/FB ratio. Gutierrez has emerged as one of the Twins top pitching prospects this season, something many wouldn't have predicted when he was drafted a year ago. When the Twins drafted him, he had a couple warning signs to potential teams. He had recently undergone Tommy John surgery. And he also only really features one pitch, a fastball. Well he's had no ill-effect from his July-2006 surgery and even jokes about getting the surgery, "even if you don't need it." And as for that fastball, well that's been his 'bread-and-butter pitch' and has had great success thus far with it. It's gained attention around the Minor Leagues and is considered one of the best fastballs 'not in the Major Leagues.' He'll need to continue to develop his secondary pitches, but the Twins obviously feel strong enough about him and his fastball to have had him skip both Rookie Ball and Single-A. And now having just thrown 80 1/3 innings in the Florida State League, Gutierrez will move up to face stiffer competition in the Eastern League. Both of these players were featured in my Top 50 Twins Prospect list prior to the start of the season. Burnett came in at #23 while Gutierrez came in at #18. These moves will certainly not be the last. With the draft approaching quickly, the Twins will continue to shuffle players throughout the system. • Anthony Swarzak struggled last night, giving up six runs over four innings of work. Three runs came from a Johnny Peralta home run which cemented a five run third inning. Unfortunately, the offense didn't help much anyways as Cliff Lee got into a groove early and held the Twins to one run through eight innings. The final score was 10-1. Justin Murphy provided a fantastic recap of the game including some information on what transpired between Lee and Twins outfielder Carlos Gomez. • Mark Healey from Baseball Digest Live had Twins blogger (and Twins content editor at Baseball Digest) Seth Stohs on yesterday's segment. The two talked Twins for a while including all of the hot topics so make sure to check it out. He was the first (at least I believe he was) to report that the Twins have promoted two pitching prospects in Alex Burnett and Carlos Gutierrez to New Britain. He then posted his second segment of his updated Top 50 Prospect list. Click here for the first segment. Hosted a live chat during the Twins-Indians game which started at 7:30 and didn't officially close until after midnight. • Cyril Morong from Cybermetrics compares Joe Mauer and Justin Morneau to some past "M&M Boy's." Morong compares the highly-powered Minnesota duo to the Giants Willie McCovey and Willie Mays as well as the Yankees Mickey Mantle and Roger Marris. Meanwhile, Phil Miller of the St. Paul Pioneer Press compares the two to Barry Bonds and Jeff Kent. • Here's a little information on the two newest Rock Cat pitchers. Carlos Gutierrez was drafted in the first round of the 2008 draft. Much like in 2007 when the Twins drafted Ben Revere, many questioned the move on the Twins' behalf. But again, like in 2007 those same doubters have been quieted by the strong play by Gutierrez. The 22-year-old former Miami Hurricane was 2-3 with a 1.32 ERA in 11 games (10 starts) in the Florida State League. He features one of the best fastballs all of the minor leagues which helped him induce 103 ground balls opposed to only 23 flyball outs. Click here to read more on Gutierrez and on Alex Burnett. • Glen Perkins will make his first rehab start since landing on the disabled list with 'slight elbow soreness.' Perkins will be limited to 70 pitches. If everything goes well, he'll make another rehab start before coming off of the disabled list. That should give Anthony Swarzak at least two more turns in the rotation. Or maybe it's Francisco Liriano who will get two more turns. Rochester Red Wings 1, Gwinnett Braves 10. New Britain Rock Cats 2, Connecticut Defenders 1. Ft. Myers Miracle 1, Clearwater Threshers 2. Beloit Snappers 1, Peoria Cheifs 2. • Jim Mandelaro writes about Brian Duensing and a 'little trick' Red Wings manager Stan Cliburn told him to do to help with his first inning pitching problems. The trick hasn't worked as Duensing continues to struggle in the first inning. • This is one feature at Target Field that I am really excited about. Is it possible to be any more excited than I am right now about 2010? • Tangotiger from Inside The Book takes a look at Joe Mauer's predicted home run totals for the remainder of the 2009 season. • Thrylos from The tenth inning stretch has given us some Twins draft thoughts over the last couple days. Make sure to check out both posts here and here. And for some draftee interviews, make sure to check out The Baseball Analysts where they have interviews with many players including St. Paul Saints pitcher Tanner Scheppers. And for more draft coverage, make sure to check out Baseball America. • And finally, the Minnesota Twins have begun campaigning for both Justin Morneau and Joe Mauer making the All-Star game. "Speak Softly & Carry Big Sticks" is the slogan. According to MLB.com, Mauer leads catchers with 769,320 votes (Jason Varitek is second with 406,788 votes). Meanwhile, Morneau is battling with Kevin Youkilis (600,175), Mark Teixeira (506,399) and Miguel Cabrera (444,492). Morneau is in third place with483,226 votes. Make sure to vote! And make sure to write Denard Span in.